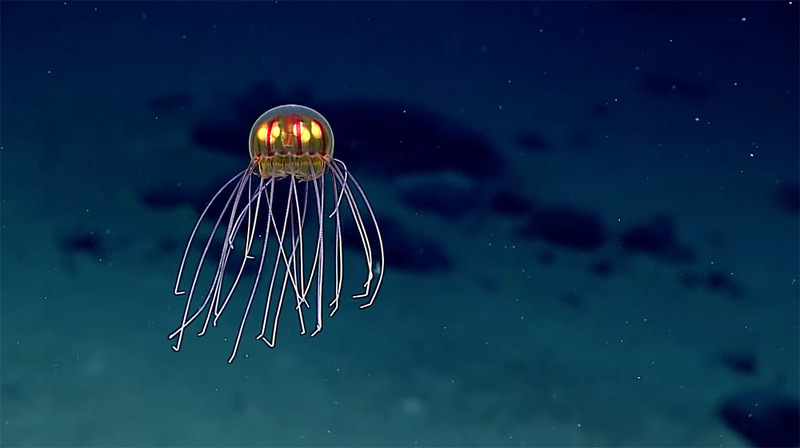 Scientists believe this animal belongs to the genus Crossota, a group of jellies that does not have a sessile polyp stage; all phases of their lives are ocean drifters. They also believe this animal is an ambush predator – note the posture it had assumed in the first half of the video: its bell motionless with its tentacles outstretched like the struts of a spider’s web, waiting for something to bumble into them. The red canals, they suggest, appear to connect the bright yellow objects, which may be gonads. Update: An earlier version of this article mentioned the jellyfish may be ‘bioluminescent’. While that may be true in some regard, several people with much more impressive scientific credentials than mine have written to suggest the “lights” seen inside the jellyfish in this video are merely reflective. The most likely scenario is that the gonads of this particular species exhibit some form of fluorescence but do not illuminate independently. Thanks, Steven.